MainAll NewsInside IsraelHow was an illegal PA city established in the Hevron hills? How was an illegal PA city established in the Hevron hills? Supreme Court to hear petition against Civil Administration's failure to enforce the law over thousands of acres in Hevron hills. Training Ground 917 in the southeastern Hevron Hills area is a strategic firing ground located between the Jewish communities of Carmel and Ma'on, the descent to the Dead Sea, and the Arad Valley. This morning, the Supreme Court will hear a petition submitted by the Regavim organization against the Civil Administration's failure to enforce the law in this area. In 1999, Training Area 917, comprising some 55,000 dunams (13,600 acres), housed over 500 illegal Palestinian Arab-built structures. Rather than enforcing the law and evacuating the squatters, the Civil Administration marked off the area and set aside thousands of dunams of land, creating a no-go zone and effectively legalizing the illegal construction. In the years that have passed since then, Palestinian Arabs have taken over more and more sections of the IDF training grounds through mass-scale illegal construction. More than 1,000 additional Arab homes have sprung up in Training Zone 917, hundreds of them outside of the legally-questionable no-go zones set aside by the Civil Administration. The infrastructure that services the residents of these homes –the power grid, the water system, roads, as well as public structures including educational and religious institutions – are made possible by generous foreign support, such as that from the European Union and the United Arab Emirates. This large-scale construction and development has taken a massive bite out of a strategic IDF training area and expropriated a massive swath of state land. For all intents and purposes, a new, illegal Palestinian Authority city has been allowed to spring into existence, with the tacit consent of the Civil Administration. 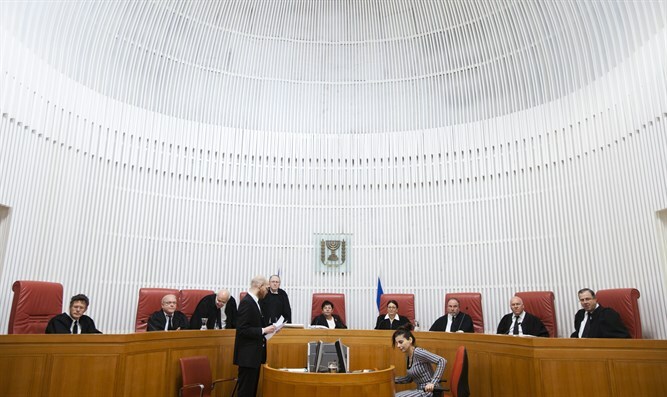 Today, the Justices of the Supreme Court will hear a petition submitted by Regavim calling for building-code enforcement and a halt to the rampant illegal construction that continues to undermine the rule of law on territory set aside for IDF training in the southern Hevron Hills.